The Bore of Venice: Election Diary - Day 10: Non-Dom, Non-Dom. Do doo, do do doo. Election Diary - Day 10: Non-Dom, Non-Dom. Do doo, do do doo. Trouble was brewing in Conservative HQ. The Labour party had announced that they will abolish the controversial “Non-Domicile” (or “Non-Dom”) tax status, meaning that foreign millionaires or international business persons will be more liable to pay tax in Britain. “It will cost the Treasury millions and damage our economy,” said George Osborne. Joey Essex’s journey is continuing, and today he has the dubious honour of meeting Nigel Farage. “I like your coat,” said Essex politely. A reporter later asked Farage whether he knew who Essex was. Turns out he doesn’t. Which is worrying because that means that Nigel clearly doesn’t watch the news. Joey’s all over that programme. Then, in an attempt to get to know each other better, they took a boat trip together. Around Grimsby. Mrs Farage must be a very lucky woman. The first Mrs Farage, I mean. It was practically a champagne socialist breakfast at Labour HQ. The latest polls are putting them a few points ahead, the Non-Dom policy was dominating the front pages, and Nicola Sturgeon was flirting with them in public. Everything was coming up Miliband. Still, one researcher was running around asking questions. Some idiot in the Labour party basically became George Osborne’s mouthpiece, saying: “I think if you abolish the whole Non-Dom status then probably it ends up costing Britain money because there will be some people who then leave the country." 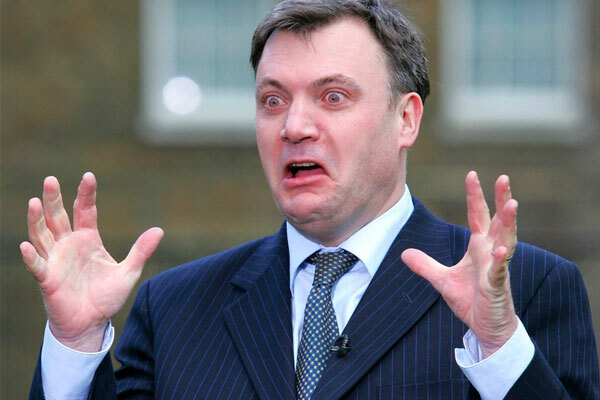 “Which moron said this?” demanded Ed Balls. No such hiccoughs for Ed Miliband. Not even when he was facing off with Paxo has he looked this confident. He is in Coventry, talking with genuine fervour, chest puffed out and shoulders broad. It’s like Labour have injected him with the secret serum. In CCHQ, they gaze on helpless. George Osborne is calling the policy “a total shambles”, but they may be onto a hiding here. It looks like they are defending the wealthy few, whilst Labour have seized the news-cycle, and then it just gets worse for them because Nigel Farage has done something even more terrible. Nigel’s anti-aging tips include getting your five pints a day, killing off nasty cold bugs with cigar smoke, and closing the borders. Labour’s fighting-talk continues, as Ed Balls, having remembered himself, reveals that the infamous clip of him suggesting that the abolition of Non-Dom status may lead to a mass-exodus of many big investors was edited by the Tories. That utterly vague expansion aside, the question remains over how much this will raise. Labour are still talking “many millions”, a figure which they say has been suggested by “many people” including “that bloke in the suit” and “a very nice woman – wears glasses, swanky business card”. The Institute for Fiscal Studies, which will shortly have to change its name permanently to “The Independent Institute for Fiscal Studies”, says there are too many unknowns to put a figure on it. The two old university friends on opposite sides of the political divide are meeting for one of their lunches. “I know old boy. They may just leave the country, or they may stay,” replied the Labour man with candid caution. “Well, I would,” said the Labour man to his stunned opposite number. David Cameron decides to take a walk away from the electoral mire and stops by a Bolton school to read The Very Hunger Caterpillar to some primary school children. “Out of the mouths of babes” and all that. Or in this case, “Out of the body language of babes”, as one child represents the mood of the nation. The Greens have released a party political with all of the other party leaders as a boy band. Preparations are well underway for another banquet dinner at the home of a Non-Dom in Chelsea. He is delighted to see that Labour have given him and other Non-Doms a few years to sort out their tax affairs, and there is much to decide.